Edited by Keatah, Wed Jun 7, 2017 1:48 PM. This article: author seems book intelligent but disorganized. I do agree with his overall assessment, but some of his points trail off without resolution. First, this is a claim against a tertiary fan doing a popular interest post, not a homebrew producer or advertisement (as Coleco adamantly claimed they were). I don't think he ever clarifies that or makes the transition clear, as most of the story focusses on the latter. In the following paragraph about Niles the camel, it sounds like he begins talking about one thing and ends talking about something completely different. It begins with the junior user trying to accuse the senior user of infrigement and lay claim to the trademark. In the middle, he seems to establish that the court was sympathetic to various facets of the small, senior user and then ends with the senior user not being able to claim defamation since the junior user did not accuse them of piracy. But what about the initial claim of infringement by the junior user? That is not defamation of the senior user? And what became of the junior users claim of infringement? Did they win or lose? Notwithstanding, in Coleco's case, the junior user is also claiming trademark infringement by the senior user. Homebrewers are a small, senior user, so the situation seems similar, but the blogger never finished answering his initial inquiry. "Here, if Coleco Holdings has an inferior right to use the ColecoVision trademark compared to homebrew community, it may wish to nonetheless seek to block the homebrewers and claim that they were the infringers and lay claim to the general availability of ColecoVision trademark. The facts of Peaceable Planet may help illustrate the concept. Peaceable Planet made a plush toy camel called "Niles", a reference to the Nile Delta of Egypt. It sold a few thousand of these stuffed animals. Id. at 988. Ty, Inc., the makers of Beanie Babies, later sold a plush toy camel called "Niles" and its sales were in the millions. Id. The Court recognized that unfair competition may exist when a larger company tries to shut out a smaller company. Id. at 992. It also recognized that a smaller company like Peaceable Planet may unjustly may be perceived as manufacturing a pirate product. Id. at 993. The Court recognized that most consumers "would probably not care a whit" that an infringer may be selling pirate products, especially if the quality is identical to the lawful product. Id. at 993-94. It also acknowledged that highly ethical consumers may turn away from the pirate and his goods. Id. at 994. However, a claim for product disparagement or defamation cannot be made unless the junior user (Ty, Inc.) was responsible for creating the false impression that the senior user (Peaceable Planet) was a pirate. Id." ..I mean, anybody can "wish to seek" to do anything. So is this a case of sue and counter-sue and who was successful. He doesn't say, but I suppose the 4 1/2 to 2 1/2 in favor of homebrewers may answer that regarding the name "ColecoVision". Also, I believe the current situation has to do with the "Coleco" name trademark as well, for which he at one time claims the current Coleco had nothing to do with the old Coleco's decisions, so cannot get favor from them, but in #5 claims the Coleco name trademark is strong becuase of decisions made in the past. So... it's believed that Ben Heck was funded by Coleco to build a portable Coleco system? Does this mean Coleco will start butchering perfectly good Coleco systems for a limited run of portables? No. Ben doesn't produce anything like that commercially. He has done onesies and twosies for a few people on request for a fairly high price ($300-400+ or so for one of his custom portables) and with a lead time of several months, but it's a fun hobby for him, and a learning exercise, not an enterprise. So yes, the specimen Coleco provided is completely bogus. Yes. I meant the lie is on coleco/rwb's part. Not the article or BH. Ben Heck has already stated that coleco/rwb connected him in 2008 about licensing the handheld he created in 2005 retroactively. They had a "license deal". Was sent a link to this article. Can offer a bit of information. In March 2008 River West Brands contacted me about "authorizing my use of their trademark". Basically coming to an agreement (posthumously) that it was OK that I used the logo a few years prior. I also gave them the files of my re-created Colecovision logo. So yes they authorized my use of the logo, but over 2 years after I built a one-off item. Edited by Bill Lange, Wed Jun 7, 2017 2:20 PM. Are you f'ing kidding me? 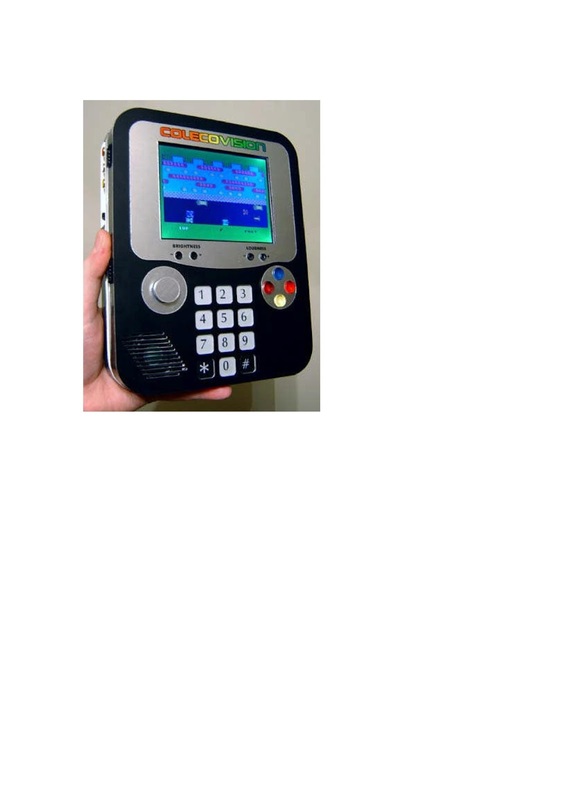 They submitted a picture of Ben's portable ColecoVision to secure the Coleco name/trademark? Something they had absolutely no involvement with? A BLATANT LIE? If that's not grounds to file suit against them to overturn this travesty I don't know what is. "The trademark was allowed on January 3, 2006, Reg # 3490101. The allowance triggered RWB's requirement to show actual use of the mark in commerce. It obtained four extensions of time to file a statement of use, and during that time assigned the mark to Coleco Holdings, LLC. On July 1, 2008, Coleco Holdings filed a Statement of Use and a photograph of the specimen product it intended to show as use in commerce:"
So they "authorized" the use of "their" logo in March 2008 and yet they weren't approved for it (they were on their 4th extension) but then used Ben's one-time retro-actively approved use of the logo as justification to file on July 1 2008 that they had in fact used the trademark in commerce?!?!? A bottom feeder is usually an aquatic animal that feeds on or near the bottom of a body of water. The body of water could be the ocean, a lake, a river, or an aquarium. Bottom feeder is a general term which is used particularly in the context of aquariums. Biologists often use the term benthos, particularly for invertebrates such as shellfish, crabs, crayfish, sea anemones, starfish, snails, bristleworms and sea cucumbers. However the term benthos includes all aquatic life that lives on or near the bottom, which means it also includes non-animals, such as plants and algae. The programmer is a victim in this mess because he didn't know what Coleco was doing behind the scenes. He already programmed for the game for 6 months before he announced the game. The person who's doing the game actually did a Nes homebrew arcade port that I don't think is released yet. I've seen a youtube of the NES arcade port and it is a very good port. Edited by 8th lutz, Wed Jun 7, 2017 3:46 PM. I've been following this thread with a mixture of confusion, frustration, and curiosity, I agree with you everyone that the less said about Coleco Holdings, the better. I loved the care and attention that homebrew developers displayed when they created packaging for their games that imagined an alternative reality - one where the Greenburg family dodged the Crash, continued to lead Coleco Industries Inc, and released more "arcade quality" titles for our favorite system. Like everyone, I'm disappointed that the ham-fisted actions of a holding company has tried to high jack that incredible creativity with questionable assertion to trademark ownership, let alone proper demonstration and proof of use. If we all had deeper pockets and free time, it would be a fascinating excercise to continue "business as usual" and respond to any letters and threatened court action as necessary. Trademarks can be contested and trademarks may be found to be expired or abandoned in different national jurisdictions. That said, this has sapped a lot of the creative energy and enthusiasm of this amazing community. Let's take our cue from former third party publishers like Parker Bros, Imagic, and others - the Coleco logo is cool, but it was always the games that made the ColecoVision our favourite system. Thank you homebrew developers for your passion - I look forward to playing more of your great titles. Edited by The Evener, Wed Jun 7, 2017 4:44 PM. Nobody is ever allowed to use the Coleco name, ever, in any context, period. So am I interpreting this correctly? Coleco Holdings LLC duped the USPTO into believing that Ben Heck's portable CV was one of their products and was being commercialised by them thus enabling them to renew their rights to stay registered with and "own" the ColecoVision trademark. So at best they intentionally lied to the USPTO and may be subject to some kind of disciplinary action and/or penalties and/or loss of the trademark. And at worst they intentionally lied to the USPTO and may be subject to legal action and loss of the trademark. Note that in both cases I state that they "intentionally lied" and this is because I wholeheartedly believe that, based on recent experience, this is exactly what they did. PS... I'm a 36 year old dude. Where do I sign up to get my Coleco Girl Scout Fun Patch? PPS... Any New Jersey AAers should team up and attend flash mob style, print expose flyers pointing to this thread, and spread them around at the expo. Oh crap, this was s'posed to be a secret. Anyway, smell you laters fellow haters! I still need to catch up, but who is going to bring their girl scout to a convention that will mostly be populated by middle aged men? I wouldn't. This has grown beyond a few facebook retractions. There is more at stake here.